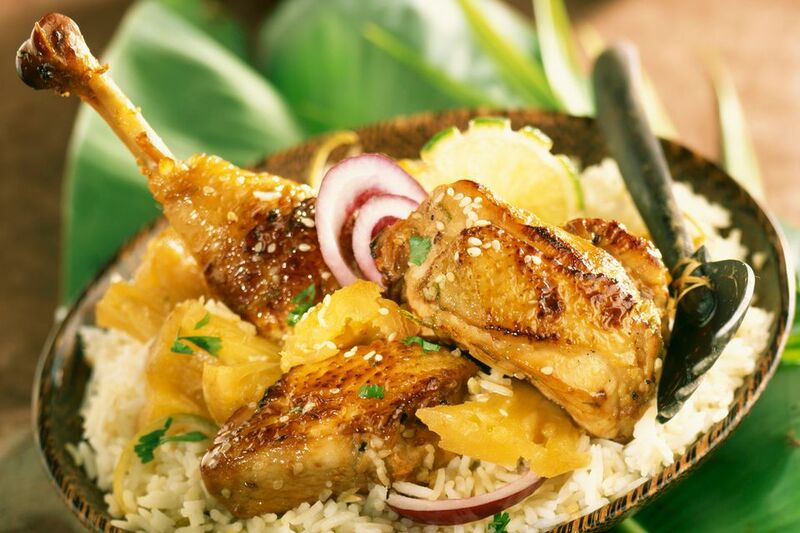 Infused with colorful Caribbean flavors, this sauce has a hint of jerk components that adds a powerful kick to grilled chicken. If serrano peppers are too spicy, use a milder jalapeno. If you are a seasoned hot pepper eater, then by all means, add 1 seeded habanero to the sauce as your pepper base. Enjoy this sauce thickly slathered on your favorite chicken pieces or even use on pork or seafood. Into a food processor add pineapple chunks, onion, garlic, and seeded serrano peppers. Blend mixture and set aside. In medium saucepan, heat olive oil and add puree. Be careful as the onion and peppers can cause fumes, so open a window. Cook mixture for one to two minutes, stirring often. Add ketchup, vinegar, herbs, and spices to saucepan. Allow sauce to simmer on medium-low heat for six to eight minutes. Remove from heat and let mixture cool completely before using. Place chicken pieces into a resealable plastic bag and pour mixture over top. Gently toss to coat, seal bag an place into refrigerator for four to eight hours. For whole chicken or larger pieces of poultry, use a larger bag or deep baking dish. Marinate for six to 12 hours. Apply sauce onto chicken toward the last half of cooking time. Simmer mixture on low for 10 to 12 minutes. Remove from heat, cover, and keep warm. Once chicken has finished grilling or baking, serve with sauce on the side or drizzled on top.